Former England manager Sam Allardyce thinks Spain and Barcelona midfielder Sergio Busquets is "no better or worse" than Tottenham's Eric Dier. Allardyce made the bold claim in an interview with talkSPORT following England's 3-2 victory over Spain in the Nations League on Monday, but what does the data suggest? With the assistance of Opta, we compare the two players to see how Big Sam's assessment stacks up with the facts. "Busquets is a sitting midfield player who breaks up play, intercepts..."
Allardyce provided an accurate description of a large part of what Busquets excels at, and since the start of the 2016-17 season he has made 290 tackles, 160 interceptions and 685 recoveries in all competitions for Barcelona. Those numbers increase to 339, 189 and 832 respectively when you take his appearances for Spain over the same spell into account. Dier – whose total appearance tally of 129 is only two fewer than his rival – trails in all three categories, with his overall record standing at 204 tackles, 143 interceptions and 594 recoveries, though he has often split his time at Tottenham between midfield and centre-back. The only similar facet in which Dier holds the upper hand is blocks, making eight for England in 25 outings and 38 for Tottenham – five and 17 more than Busquets has made for Spain (22 appearances) and Barcelona (109 appearances) respectively. "Busquets passes it very quickly and is intelligent…"
As you would expect from someone playing in the middle of two teams known for keeping the ball on the floor and recycling possession, 30-year-old Busquets leads Dier in terms of distribution. The Spaniard has passed the ball almost 2,000 more times for club and country than his counterpart (9,578 to 7,629) and has done so with greater accuracy (90.8 per cent to 86.6 per cent). It is worth noting the gap between the two decreases when looking solely at their international appearances, where Dier has featured mostly as a central midfielder. His passing accuracy for England stands at 89 per cent, but Busquets rises from 90.5 at Barcelona to 92 with Spain. 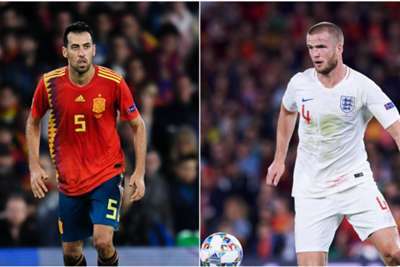 "He's not much more than that…"
Busquets has scored only once for club and country since August 2016, three fewer than Dier. He has had just 23 shots on goal in the same period and hit the target with six, so compared with Dier (96 shots and 24 on target) he poses less of a direct threat to opposition goalkeepers. However, Busquets has provided more assists (10 to 5) and created more chances (83 to 52) than Dier, suggesting he still has a strong influence going forward.